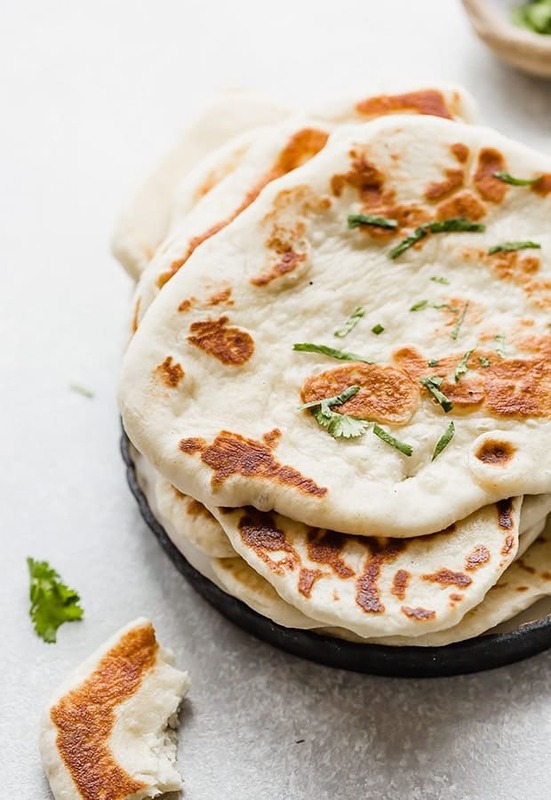 If you’ve been looking for an easy recipe for Naan Bread, you’ve come to the right place! 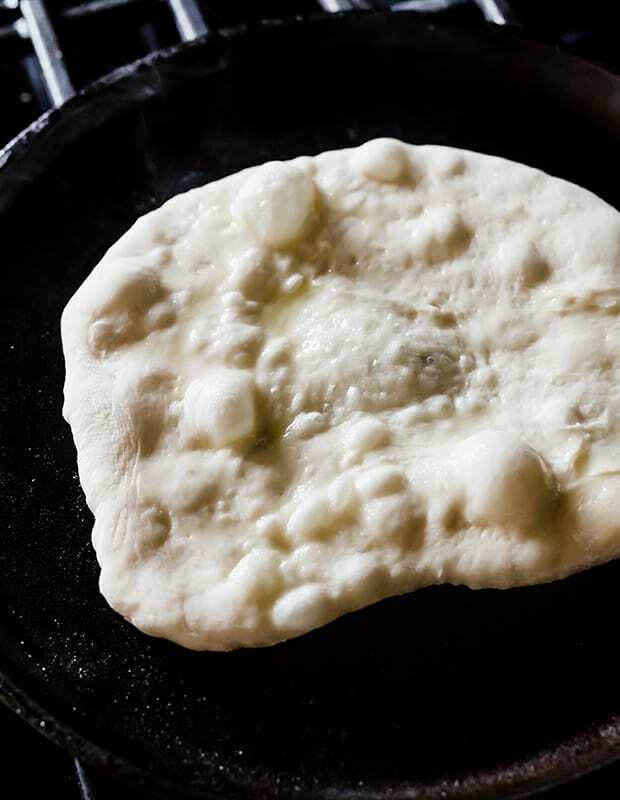 Naan is known for its characteristic crispy underside and chewy bread bubbles. 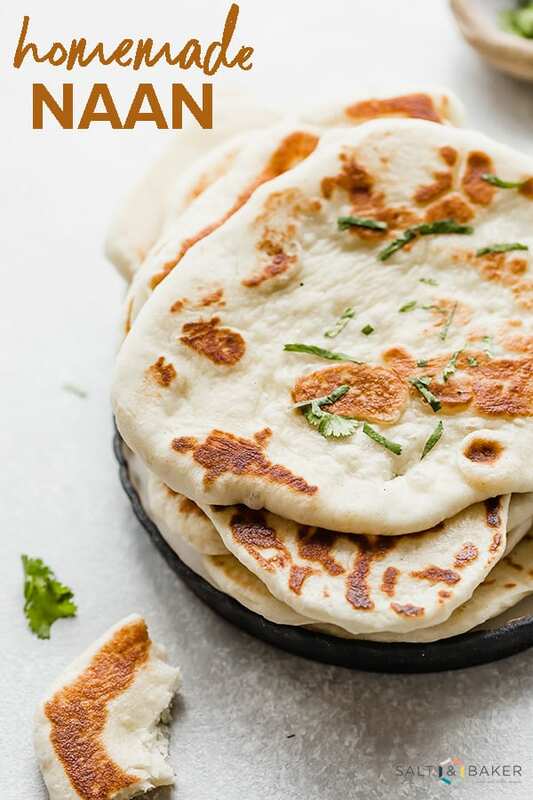 This Indian flatbread is soft and chewy and made with greek yogurt! This flatbread is like a spoon. Talk about an oxymoron! But in all actuality, naan is often used to scoop up saucy dishes. It’s commonly served with curry recipes like my Chickpea Curry. or Massaman Curry recipe. Truthfully, you can’t go wrong with naan. You can even use this flatbread to make easy pizzas or grilled cheese sandwiches. It pairs perfectly with beet hummus or as a side to my greek pasta salad. Naan is a leavened oven-baked flatbread. Leavened meaning it has a raising agent such as yeast and/or baking powder (or baking soda) in the bread. This naan has yeast and baking powder. Traditionally it’s cooked in a tandoor, or a clay oven. The naan recipe I’m sharing today will be cooked on a cast iron skillet on the stove. 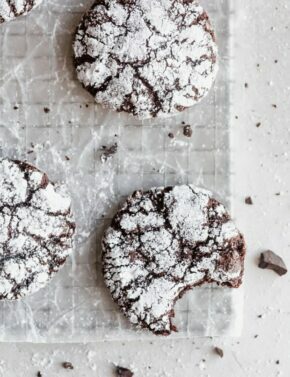 If you have a stand mixer, this process is a breeze. However, you can knead this dough by hand and get the same results, it will just take a little extra time and more muscles. In a large bowl (or the bowl of a stand mixer) add the warm water, sugar, and yeast. Let this mixture sit for 10 minutes. You need time for the yeast to activate. Once the yeast has bubbled add the remaining ingredients: flour, greek yogurt, baking powder, salt, and egg. Using the dough hook, mix the dough for 4-5 minutes. The dough should come away from the sides of the bowl. 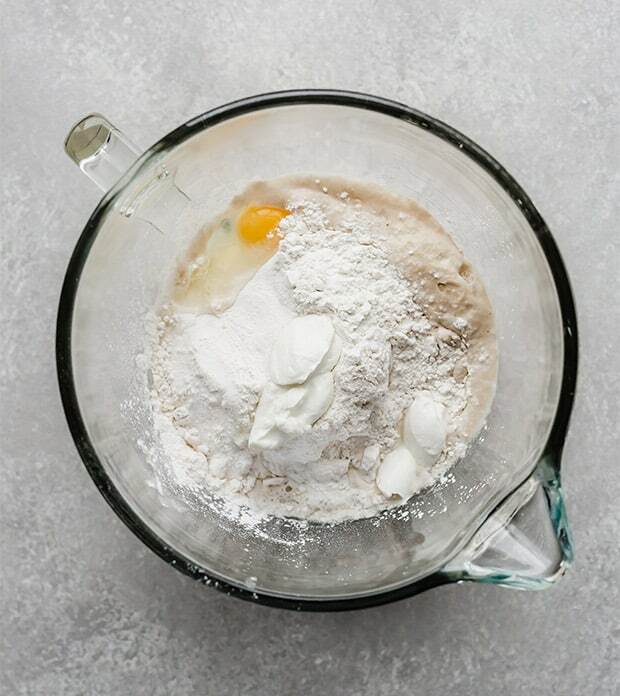 If you aren’t using a stand mixer, use a wooden spoon to combine the ingredients, and then turn the dough out onto a lightly floured surface and knead the dough with your hands for 8-10 minutes. If the dough is too sticky, add a tablespoon of flour at a time until the dough is smooth and elastic. Place the naan dough in a lightly oiled bowl (I use about 1/2 teaspoon of vegetable oil), turn the dough, and then cover with a warm damp cloth. The oil keeps the dough from drying out. Let the dough sit for an hour or until doubled in size. Left: Naan dough prior to rising. Right: dough has doubled in size. For added flavor, we’re making this somewhat of a garlic naan bread. Melt 4 tablespoons of butter in a skillet; to the melted butter add the minced garlic. Using a wooden spoon or heat proof spatula swirl the garlic around the butter for 60-90 seconds. Pour the butter through a fine mesh strainer into a clean bowl. Discard the garlic bits. Tip: to boost the garlic flavor and intensity add some of the garlic bits back into the butter after passing it through the fine mesh strainer. The dough has risen and now it’s time to to cook them. First, you need to divide the dough into 8 equal pieces. I do this by cutting the dough into 8 “pie slices.” If you want to get really accurate you can use a kitchen scale to measure each dough ball. Roll each ball of dough into an oval or circular shape. Tip: The rolled out naan should be no greater than 1/4″ inch thick. I keep mine fairly thin because they will puff up as they cook. If they’re too thick, they may not cook throughout. Then, using a pastry brush, brush one side of the dough with the garlic butter and place that buttered side onto the skillet. While it’s cooking on the skillet gently brush the other side with the butter. Cook the naan for 1-2 minutes on the first side and then flip it over and cook the other side for another minute or two. You’ll have to finagle with the temperature so that you can get the heat of the skillet just right. Yes, you can. To do so, wrap the naan in aluminum foil and then place the foil wrapped flatbread in a zip top bag. You can freeze naan for 1-2 months. When ready to eat it remove it from the freezer and bring to room temperature. Warm the naan in the microwave if you wish. Cast iron skillet – I love mine! Buy a nice skillet and it will last you forever. Garlic mincer – I use mine every single day. Stand mixer – everyone should own one of these! I use mine daily. I also love the glass bowl that it comes with. 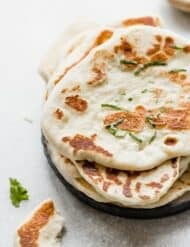 There you have it, an easy recipe for naan bread! 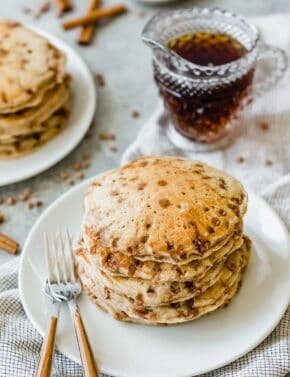 If you make this recipe, or any other recipe on the blog don’t forget to leave a comment and review! Who knows, maybe your comment will be the one featured in Salt & Baker’s weekly newsletter. Craving more? Don’t forget to SUBSCRIBE TO SALT & BAKER. You’ll get new posts, newsletters, and so much more delivered straight to your inbox! Homemade naan is easy to make. 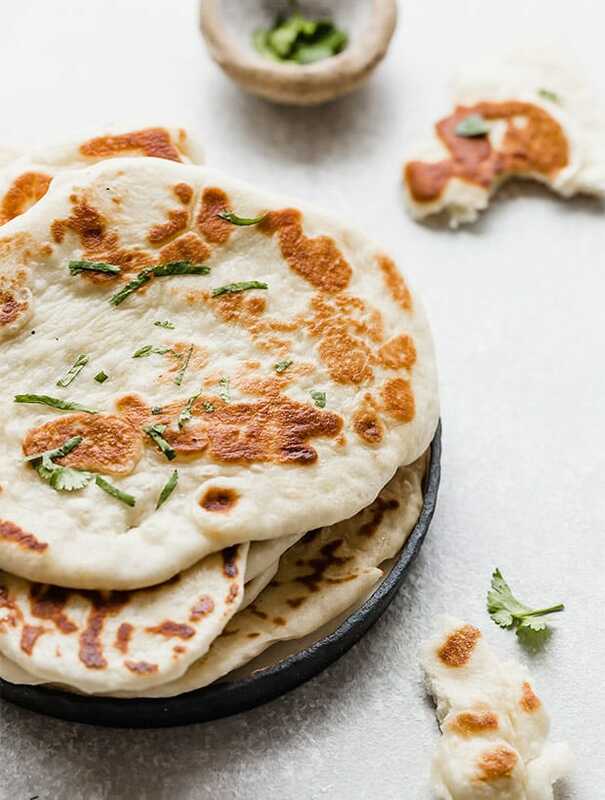 This naan uses greek yogurt and is topped with a garlic infused butter. 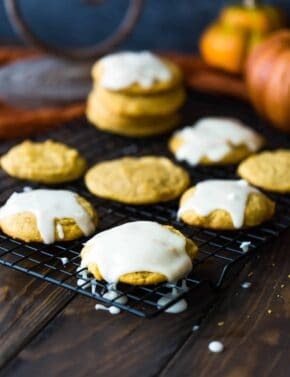 In the bowl of a stand mixer fitted with the dough hook, add the warm water, sugar, and yeast. Mix for a few seconds until it’s combined. Let sit for 10 minutes until yeast becomes foamy. Add the flour, salt, baking powder, Greek yogurt, egg to the bowl. Mix on low speed until the dough is smooth. Dough should pull aways from the sides of the bowl. If the dough is too sticky, add a touch more flour. Continue mixing for 4 minutes. Remove the dough and place it in a lightly oiled bowl. Cover with a damp warm towel and let rise for 1 hour or until doubled in size. In a sauté pan, over low medium-low heat melt the butter and add the garlic cloves to the butter. Cook for 1 minute. Pour the garlic infused butter through a fine mesh strainer and discard the garlic bits. Keep the garlic butter nearby in a separate bowl (this will be used to cover the naan before cooking them). Once the dough has risen, divide the dough into 8 equal sized dough balls. On a lightly floured surface, roll each ball out into a circular/oval shape, no greater than ¼ inch thick. 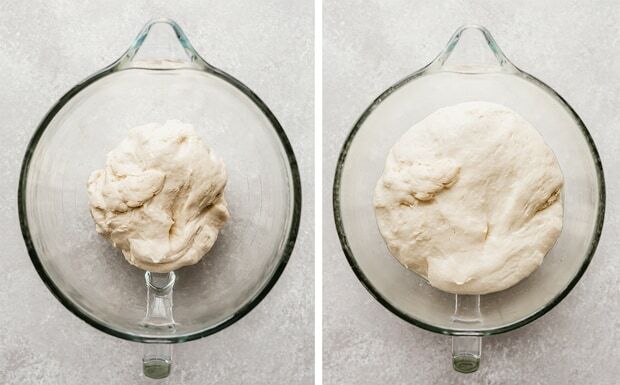 Do this with the remaining dough balls. Heat a large saute pan or cast iron skillet over medium to medium-low heat. Brush the naan with the garlic infused butter (on both sides). Place the naan on the skillet and cook for 60 to 90 seconds. Flip the dough and cook the other side for another minute or so. Watch them closely because you may have to finagle with the temperature of your stove top. The naan is done when both sides appear golden brown. Remove from the pan and place on a plate. You can cover the naan with a towel to keep them from drying out if you wish. 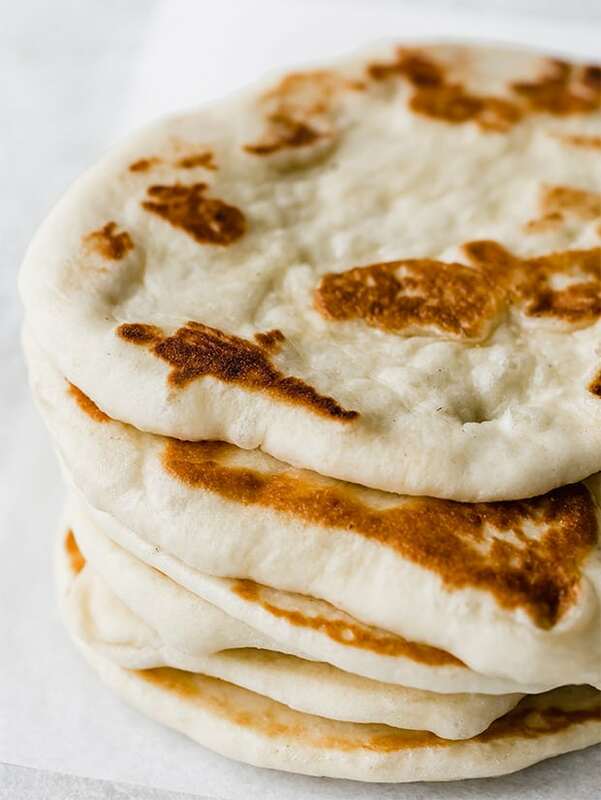 Naan will last up to 3 days at room temperature in an airtight container or ziplock bag.